With the huge competitive advantage well designed technology products give to universities and colleges, an understanding of usability and user experience is key to their success. What are usability and user experience? Institutions need to ensure that they have usability experts on the staff, or enough in-house know-how to make best use of external expertise. Usability techniques can be inexpensive and easy to implement, giving a good return for a modest investment. The first section of this briefing outlines what we mean by usability and its relevance to a university's or college's success. The second section gives some tips and draws on case studies to help developers who are not usability experts make a start with applying to the development of technology products and services. Usability and user experience relate to how well a product (or service) is designed, but there are subtle and important distinctions between them. 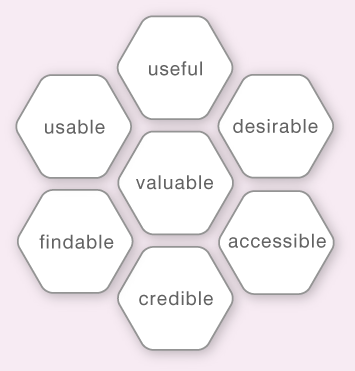 Peter Morville's 'user experience honeycomb' (figure 1) proposes a structure for good user experience. Successful products or services are 'valuable', an element positioned in the honeycomb's centre. Elements that contribute to this value are desire, usefulness, usability, 'findability', credibility and accessibility. Designing a simple and enjoyable experience for users is not a simple task. It requires expertise in graphic design, interaction design, user experience design, coding, copywriting, marketing and management. Why is this important for universities and colleges? Universities and colleges host, manage and develop a huge variety of information technology systems, from the institution's public-facing website, to internal finance systems, to student management systems. Whenever people interact with these systems, usually in a web browser or application, they will form a view about the quality of that experience. "The experience IS the product and the only thing users care about"
What does this mean for the numerous audiences that interact with these systems? For an external audience, an institution's public website is its shop window. It should inspire, impress and entice students and academics, while providing them with the information they seek in a clear and understandable form. Potential students will inevitably make comparisons between universities based on their websites and social media channels, and will be accessing this information on a variety of different devices. Evidence is already emerging that students are starting to view higher and further education choices as a consumer decision. There is a real risk that they will be much more critical of poorly designed services if they feel they are personally paying for the service in some way. An institution that provides engaging and useful online experiences may be at a significant advantage in attracting the best and brightest students and staff. Internal staff need systems that support rather than hinder them to do their jobs. Poorly designed financial, management and library systems can be hugely de-motivating and inefficient. Improving the usability and efficiency of these systems can bring enormous cost savings when scaled across an institution. By applying usability techniques, projects funded by Jisc substantially increased data downloads or user ratings of their web services. After implementing a new interface, file requests to the Digimap service increased by up to 357%. This was attributed to better surfacing of available datasets and making the process faster. Usability and user experience can be powerful strategic tools for institutions. Instead of focusing on a top-down implementation of technical solutions to meet perceived requirements, they take a bottom-up approach and focus on human needs. By doing so, they provide a tremendous opportunity to design the right tools for staff and students, rather than simply presenting them with developer-led tools that require expensive training and support. Taking this approach requires a major commitment from the most senior decision-makers within institutions, though. Responsibility for user experience often rests with developers and web content editors, as few universities and colleges have in-house user experience specialists. The use of external consultants or agencies usually results in improved research insights and better design decisions. However, external agencies and consultants often work remotely, rather than being embedded, so any expertise is rarely brought directly into the core team. The interdisciplinary nature of user experience-led design generally means that the most effective teams are those that work closely together, communicate effectively and share a vision for what they are designing and why. Each member of the team requires a broad appreciation of the basics of usability and user experience. Staff training can certainly help: an alternative is to hire external user experience professionals in mentoring roles in order to increase levels of in-house knowledge. The following is aimed at developers who are not usability experts, but who need to design valuable and desirable web services for different audiences within their institutions. Understanding the core philosophy of user-centred design is essential for anyone involved in designing better experiences. 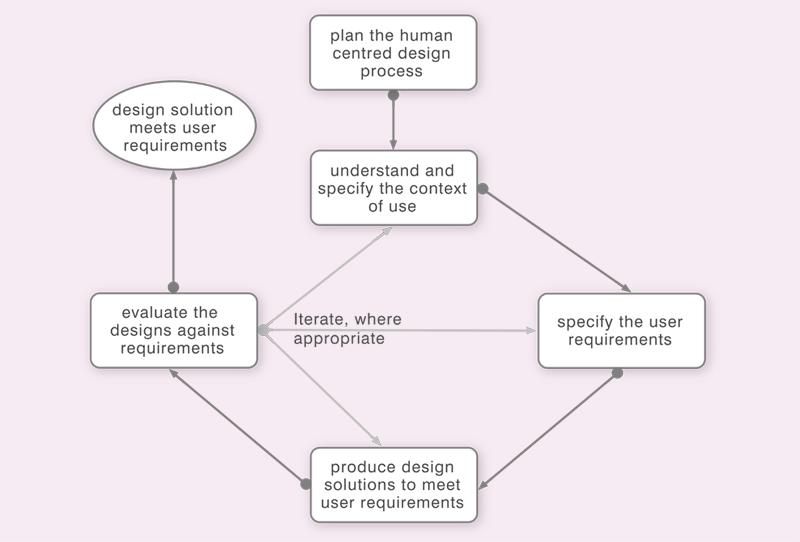 A very useful starting point for achieving this is the International Standard ISO-9241-210, 'Human-centred design for interactive systems', see figure 2. It is worth noting that 'maturity' in user experience (ie making user-centred design methods and processes culturally embedded within an organisation) can take months or even years and require significant vision and investment from senior figures within the institution to effect the necessary change. As a result, much of the valuable user experience work that is done within universities or colleges is quite piecemeal and done 'under the radar' of senior management. Unfortunately, this means that there is usually no official channel to support the sharing of skills and lessons learned from adopting user-centred design methods on a per-project basis. An old user experience adage is 'you are not your user'. Historically, many college and university websites have been inward-facing, reflecting the internal organisation of the institution rather than framing content so that it directly meets the needs of users. Usually, some form of user research is required to 'get into the minds' of users, to understand their behaviours and motivations, what they are trying to achieve, and the wider context of their actions. This can involve research techniques ranging from user interviews and surveys, to insights from help-desk staff and web analytics. Even if time and budget are limited, it is still possible to carry out less formal research (so-called 'guerrilla' research methods). User personas, which are research-based user profiles for each of your key audiences, can help project teams develop a shared vision of the user experience. Each persona has a name, a back-story and an outline of their key goals, behaviours, motivators and 'pain points'. Since they are a communication tool, a print-out of each persona should be placed in a prominent location, such as a wall in a shared office or meeting room, and be used by all team members to rationalise design decisions and empathise with specific user needs throughout the design process. It is important to note that personas should be based on behavioural audience segments (eg audiences with different goals or attitudes) rather than traditional marketing or demographic groupings. Figure 3. 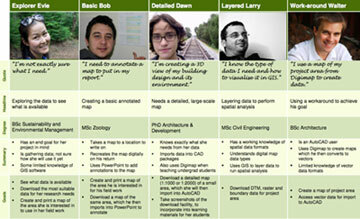 Personas from the Jisc Digimap project. Download the personas (pdf). As part of a project to enhance the usability of Jisc's Digimap service the Digimap team carried out 20 interviews with users and distilled these into five distinct personas based on the types of user behaviour that they encountered (figure 3). These were 'explorer Evie', 'basic Bob', 'detailed Dawn', 'layered Larry' and 'work-around Walter'. The insights gained during the persona research allowed the Digimap team to create a list of tasks for each persona. The interfaces to support these tasks were prioritised for development, based on user needs, using the MoSCoW prioritisation technique (ie Must have, Should have, Could have, Won't have). These personas worked extremely well in focusing the team on the core audience and their goals, and avoiding the potential distractions of issues that were of little benefit to users. Major design changes are extremely expensive if they occur late in the development process. Prototyping is a low cost, effective way to explore multiple design possibilities early on. Design approaches that don't work can be easily discarded with minimum cost or fuss. Sketching is particularly useful very early on in the design process. Quick-and-dirty sketches can be used to explore concepts rapidly either for internal validation against personas, or for user testing (sketches can be worked up into paper or simple interactive prototypes for testing). As designs become more certain, they may be turned into interactive, digital prototypes using prototyping tools like Axure, or HTML frameworks such a Twitter's Bootstrap. If there is close integration between designers and developers (which is the ideal scenario), developers may be able to implement design sketches quickly. This rapid sketch/implement/test approach dovetails very well with the current trend towards agile development. The Jisc-funded LocateME project adopted a user-centred approach to enhance the usability of the Coventry University library search facility across a range of desktop and mobile devices. The LocateME team used print-outs of iPhone screen mock-ups to test the flow and nature of their interface. This testing was done in the best possible context: with library users as they used the library. As the team refined the interface, they felt confident enough to mock it up as a Flash-based virtual mobile device, which offered higher fidelity and realism. Both of these approaches were much quicker and cheaper than building (and changing) a full app or mobile site. "paper prototyping gave us a very quick way of testing ideas and changes with customers, avoiding the need for lengthy development and programming work"
User testing is probably the single most useful thing you can do with your website or app. It almost always provides insights into your audience that you would never have expected, and these insights in turn generate and inspire more design ideas. User testing is often seen as a time-consuming and expensive exercise, to be done towards the end of a project. In fact, a 'little and often' approach, as part of an iterative design process, can be much more useful. You don't need a beta version of a site before you can test. Testing is possible with anything from sketches and interactive prototypes to full sites. User testing needn't be expensive. The Digimap team set up their own shoestring usability lab, spending just £40. Using 2 rooms, a video splitter and a baby monitor, they were able to provide a remote observation room for the tests. Having the whole team watch the tests was crucial for generating a shared understanding of the problems that users face. An alternative is to share a screen and webcam of a user testing session using Skype or Google+ Hangouts. "The UI testing ... was extremely useful, it pointed out many things that we had missed and now seem just so obvious." User testing provides a rich vein of qualitative insights into how your designs can be improved, but doesn't provide anything other than a gut feeling for how good your design actually is. Quantitative metrics are required for this. Some of the most obvious metrics, such as number of hits, visitors or page views, are not necessarily direct measures of success. Good metrics tend to be actionable and more rooted in actual use of the design (eg conversion rates, task completion rates, user satisfaction). It is worth noting that the more clearly defined your initial vision for the project, the easier it is to define appropriate success metrics. However, there is one general-purpose metric that is particularly useful: the System Usability Scale (SUS). Users are asked to rank their agreement with 10 simple statements (for example, 'I thought the system was easy to use'). Analysis is simple, and the output is an overall score out of 100 for a product or service. Jisc's Aluiar project used the System Usability Scale (SUS) as a quick, low-cost method for benchmarking user perception of their Synote product (an open source web-based video and audio annotation tool) prior to a project to enhance the software by taking a more user-centred approach. The SUS results demonstrated an increase in the overall SUS score from 48.5/100 in the first iteration to 67/100 in the second. The Digimap project demonstrated success in terms of data downloads from their redesigned service. After implementing a new interface, file requests increased by up to 357%. This was attributed to better surfacing of available datasets and making the process faster. "[the latest version of the software] beats the old version hands down as far as I'm concerned. The rapidity with which you can select a map extent and download all of the relevant mapping data in one go is by far much better than the slow and more manual way things used to work. Top notch stuff." This briefing is based on findings from the 2011 Jisc programme on the usability of user interfaces of library resources and research tools. Stuart has more than 10 years practical experience as a usability and UX consultant. In addition to his consultancy work, Stuart has taught user-centred design on the Diploma in Web Design and Development course at Birkbeck, University of London, and is a visiting member of staff at the University of Bristol.